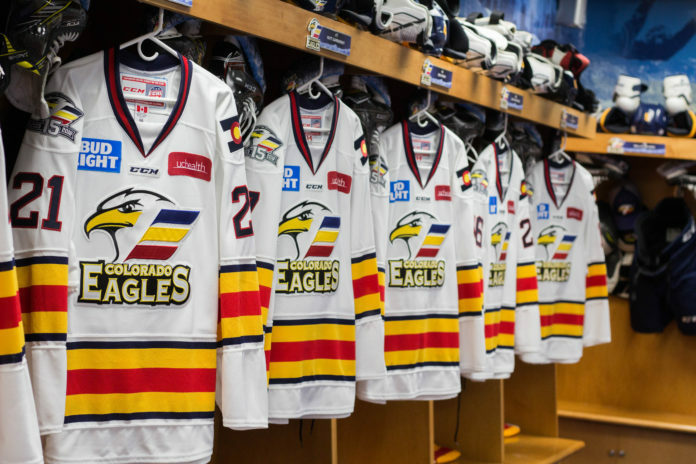 Fresh off of taking a 1-0 series lead over the Fort Wayne Komets the night before in thrilling overtime fashion, the Colorado Eagles would fall 3-2 to the Komets in Game 2 of the ECHL semifinals. With the victory, the Komets tie up the series, and they will host the next three games against the Eagles. Eagle fans would not have to wait long for some old-time playoff action, as both teams would meet up at center ice during warm-ups prior to the start of the game to exchange words and a few fists. In the scuffle, there would be only one fight between Eagles forward Joey Ratelle and Komets defenseman Daniel Maggio — a fight in which Ratelle would get the better part of Maggio, bringing him down to the ice after a slew of solid punches. Following the pregame scuffle, the Komets kicked off the first period with two powerplay goals coming from Maggio and Komets forward Garrett Thompson. Trailing the Komets 2-0 after the first period, the Eagles were able to cut into the two-goal deficit with a goal from Eagles forward Joey Ratelle. However, despite the goal from Ratalle, the Komets regained their two-goal lead over the Eagles with a goal from Komets forward Marc-Olivier Roy. With 9:17 remaining in the game, Colorado Avalanche prospect and Eagles defenseman Nicolas Meloche scored to cut the Komets lead back to one. However, the Komets, in the end, were able to hold onto the lead to even the series. Melo gets his first of the playoffs! With the series now tied, the Eagles will look to regain control of the series when they visit Fort Wayne for Game 3 on Wednesday night. Fans will be able to catch the action on ECHL.TV, or by following the Colorado Eagles Twitter page.